This game of Roulette is based on the American style Roulette that is played throughout the United States. The wheel has numbered pockets (partitions) ranging from 0 to 36 and 00. Each number is given a black or red color except the 00 and 0 which are green. The table grid is laid out so that there are 3 columns, each column holding 12 numbers or if you prefer 12 rows, each row holding 3 numbers. With double zero the house advantage in this game is 5.26%. The outcome of a game of Roulette is determined by where the ball stops on the Roulette wheel. Once the bets are placed on the roulette table, a small ball is released on to the spinning wheel, in the opposite direction to the spin. The ball stops in one of the numbered pockets (partitions) of the Roulette wheel. The objective of this popular game of chance is to predict the number the ball will land on. You place a bet on your prediction or multiple bets on color and/or sector(s). See roulette terms to find out all available bet types of the game. Column Bets - Bet on 1 of the 3 vertical columns. Chips are placed at the bottom of the column. Payoff is 2:1. Dozen Bets - Bet on 12 numbers in the high, middle or low grouping. Chips are placed on one of the following areas on the board: First 12, Second 12 or Third 12. Payoff is 2:1. Even Money Bets - Bet on 18 numbers. Chips are placed on one of the following squares: Even, Odd, Red, Black, 1-18 or 19-36. Payout is 1:1. 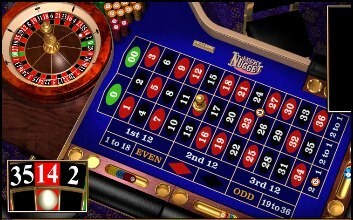 Players can place different types of bets on the table during an American Roulette game. Remember that each bet type has a maximum betting limit. American roulette combines elegant and sophisticated ambience, hi-tech efficiency and gambling excitment. I hope you will enjoy this top quality table game. You can find this American Roulette version at most of the Microgaming powered online casinos. Check out the real-time statistics on biggest American Roulette Winners.